A Cataract is a clouding of the eye’s naturally clear lens. The lens focuses light rays on the retina – the layer of light-sensing cells lining the back of the eye – to produce a sharp image of what we see. When the lens becomes cloudy, light rays cannot pass through it easily and vision is blurred. Cataract development is a normal process of aging, but cataracts also develop from eye injuries, certain disease or medications. Your genes may also play a role in cataract development. A Cataract may not need to be treated if your vision is only slightly blurry. Simply changing your eyeglass prescription may help to improve your vision for a while. There are no medications, eye drops, exercises or glasses that will cause cataracts to disappear or to prevent them from forming. Surgery is the only way to remove a Cataract. When you are no longer able to see well enough to do the things you like to do, cataract surgery should be considered. During Cataract Surgery, the cloudy lens is removed from the eye through a small surgical incision. In most cases, the natural lens is replaced with a permanent intraocular lens (IOL) implant. There are several intraocular lens options for patients such as the standard lens implant, astigmatic correcting lens implants and multi-focal lens implants. Together, you and Dr. Griffey will discuss your lens options to determine what is best for you and your eyes. To determine if your Cataract should be removed, Dr. Paul Griffey will perform a thorough eye examination. Before surgery you will have a pre-operative appointment. 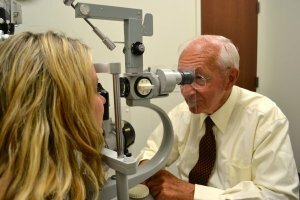 At this appointment, your eye will be measured to determine the proper power of the intraocular lens that will be placed in your eye, we will discuss your lens options with you, give you prescriptions for the eye drops you will use before and after surgery and go over your medical history and medications. Surgery is done on an outpatient basis, at an ambulatory surgery center. You will be asked to skip breakfast. You will need to have somebody with you who will drive you home after surgery. When you arrive for surgery, you will be given several eye drops to dilate your eye. A local anesthetic will numb your eye. The skin around your eye will be thoroughly cleansed and sterile coverings will be placed around your head. You will receive a mild sedative to make you comfortable during the procedure but you will be awake throughout the entire surgery. Oftentimes patients comment on seeing a “beautiful kaleidoscope of colors” during surgery, but you will not be able to see the surgery while it is happening. Under an operating microscope, a small incision is made in the eye. In most Cataract surgeries, tiny surgical instruments are used to break apart and remove the cloudy lens from the eye. The back membrane of the lens (called the posterior capsule) is left in place. The lens you and Dr. Griffey chose will then be implanted in the eye to replace the natural lens that was removed. After surgery is completed, you will be taken to the recovery area where you will sit up into a chair immediately for a snack. A nurse will go over all of your instructions for your discharge. After a short stay in the outpatient recovery area, you will be ready to go home. You will be scheduled to come in for a follow up the day after yours surgery. At this time, your vision will be checked by a technician and she will go over your eye drops and instructions. Afterwards, the doctor will evaluate your eye to make sure the lens implant is centered and the eye is free of infection. Approximately three weeks later, you will have another follow up to have the technician perform a refraction to see if glasses are necessary and the doctor will make sure your eye has healed. The success rate of Cataract surgery is excellent. Improved vision is achieved in the majority of patients if other vision-limiting problems are not present. What’s the difference between Laser Cataract and Traditional Cataract Surgery? Generally, the goal of cataract surgery is to restore your distance vision with a standard lens implant, which is done by your physician manually making a small incision with a blade. After surgery, you may need glasses for distance,intermediate,and/or near vision. This surgery is normally covered by your insurance except for co-pays and deductibles. Cataract surgery with the LenSx is a custom based procedure with computer control that assists your physician in using a laser to make the incision necessary for this surgery. This procedure is bladeless, comfortable and personalized. Most everyone is a candidate for the LenSx laser Cataract surgery, but due to the customization of this type of Cataract surgery, there are extra fees involved that your insurance will not cover. Financing options are available. Whether you choose to have the traditional or laser assisted Cataract Surgery, this procedure is designed to reduce or eliminate your need for glasses for all ranges of vision: distance, intermediate and near. If necessary, we will also address astigmatism correction. Although your insurance will cover the standard Cataract Surgery portion, there are extra fees due to the cost of the lens implant and special testing that is necessary to achieve your best visual outcome. 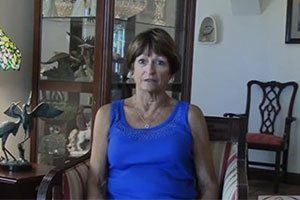 See Dottie’s experience when she realized her cataract had to be removed.